Don’t underestimate how big this place is. It will take you up to half an hour just to walk from one end to the other. The site is quite linear, so look out for the free boat service that links the two ends by taking you across the lake. The main experience here is a huge balloon which raises groups of people up to the sky. It’s officially called “Characters in Flight” and is a new-look design. The old one was removed and inspected after an accident with a similar balloon in Hong Kong. If you wish to ride, the balloon operates from 8.30am to midnight daily with adult tickets costing $18 and children $12. If you get up early, then there is an early-bird offer before 10.30am of $10 per person (2013 prices). When we were there, the balloon did not fly because the weather was too windy. Other experiences at Downtown Disney include Splitsville Luxury Lanes, a new bowling and dining experience and DisneyQuest which consists of 5 floors of games and experiences. There are lots of eating options at Downtown Disney. We can recommend the House of Blues which has its own concert venue next door and serves decent traditional American food. The other place we ate was Planet Hollywood which is more about the movie memorabilia than the food to be honest. Even if you don’t want to eat there, you can still see one of the boats used in the film Forrest Gump moored outside. 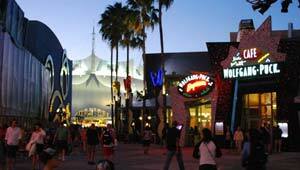 Other restaurants at Downtown Disney include the Rainforest Cafe, T-Rex Cafe, Fulton’s Crab House, Wolfgang Puck, Raglan Road Irish Pub, Portobello, Paradiso 37 (a taste of North & South America) and Bongos Cuban Cafe. There are also plenty of snack-type eateries if you don’t want a full meal too and don’t forget to pop into Ghirardelli’s shop for a free chocolate sample! Downtown Disney is sign posted on the main entrance roads for Walt Disney World and also from the I-4.